• Always use caution when working with glass. It can break easily and/or cause injury. 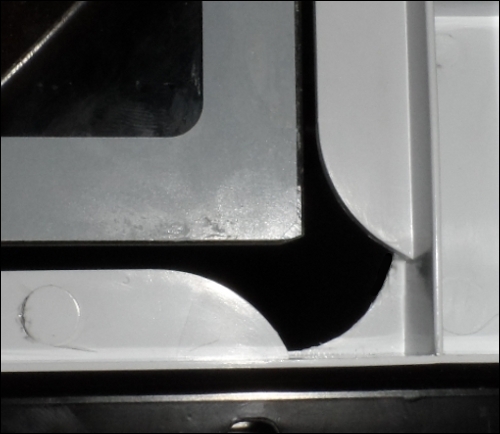 • If the retainer clips are damaged they cannot be replaced individually. Then entire shelf will have to be replaced as they are part of the assembly. • Avoid using hot water to clean the glass while it is still cold, as the glass may crack. If the clips are broken, the shelf can still be used. However, extra care must be taken when moving the shelf to prevent dropping the glass. 1 Remove both fruit and vegetable drawers. 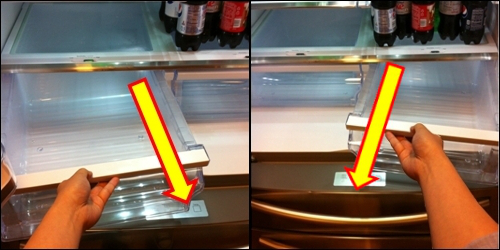 To remove the drawers, angle them slightly toward the center of the fridge as you slide them out. 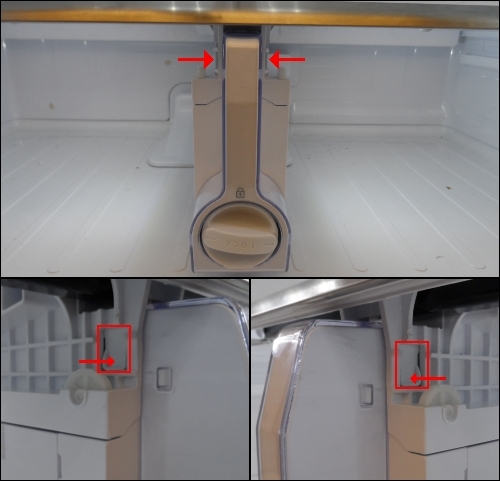 2 Next, Locate the tabs on both sides of drawer divider/water filter housing. 3 Press in on the tabs and separate the shelf from the water filter housing. 4 Now, remove the shelf by slightly lifting up as you pull it out. 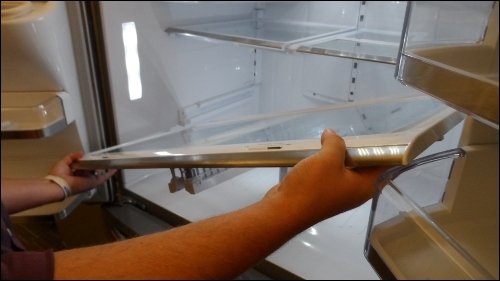 TIP: It helps if you angle one side of the shelf downward as you pull it out of the fridge. 5 Locate the shelf glass retainer clips. 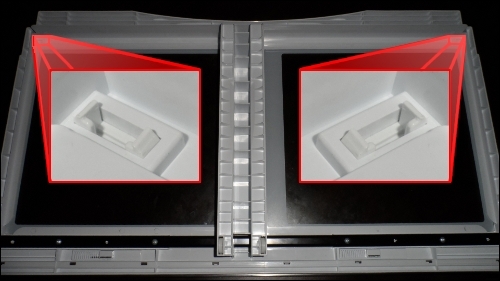 The retainer clips are located on the back left and right corners where the glass meets the white plastic. 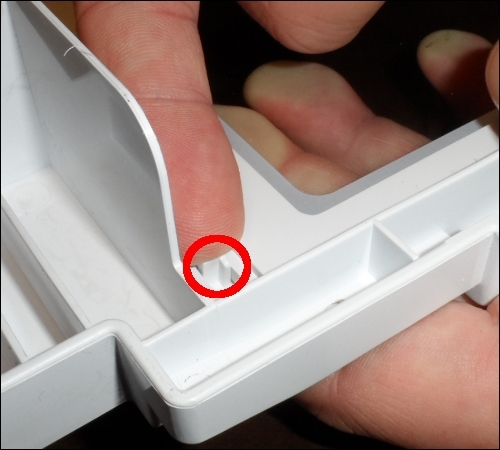 6 After carefully turning the shelf over, and placing it on a clean flat surface, locate the tabs that hold the retainer clips in place. 7 Lift each of the back corners (one at a time) of the shelf and gently push in on the tab that is holding the clip in place. 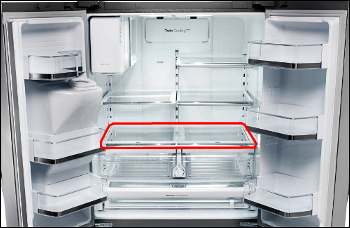 NOTE: Only push in on the side of the tab that is closest to the center of the shelf. 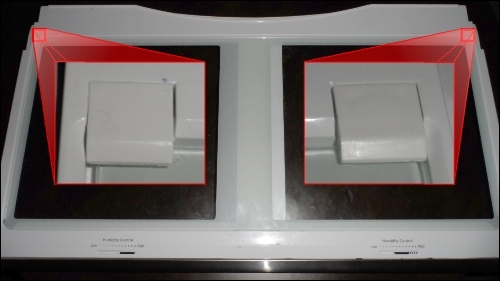 8 Once both clips are removed, gently raise the shelf and then separate the glass from the shelf frame. 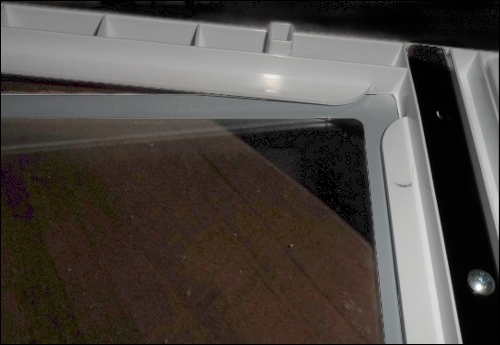 9 Clean the glass panes with water and a mild detergent or glass cleaner and wipe dry with a clean lint-free cloth. 10 To reinstall the glass shelf, repeat the previous steps in reverse. 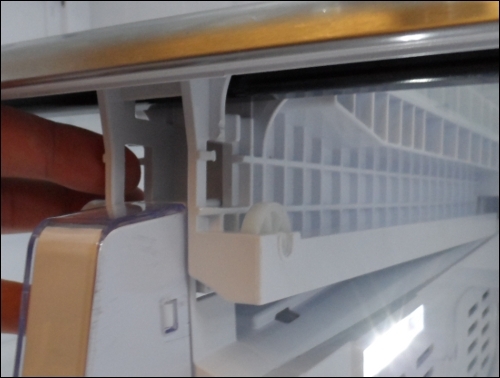 How do I reset the filter indicator light on my Samsung French door refrigerator?